SOCHI, Russia, September 1, 2011 (ENS) – Russia’s environmental monitoring service Wednesday confirmed that Sochi’s Mzymta River was polluted by a 30 kilometer-long spill of liquid waste that covered the river and Black Sea shore with white foam. 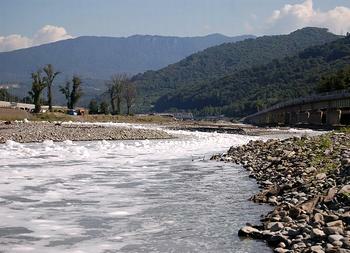 The Mzymta River is a source of drinking water for the entire Adler district of the city of Sochi, location of the 2014 Winter Olympic Games. 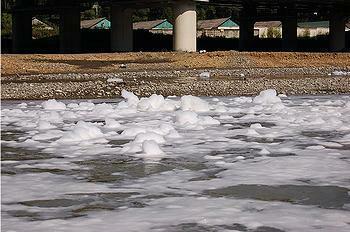 The waste formed foamy peaks of up to 50 cm (20 inches) high on the river and on the shore of the Black Sea at Adler. Alerted by local residents, the nongovernmental group Environmental Watch on North Caucasus inspected the source of the pollution about 30 kilometers (20 miles) up the river from the Black Sea. A stream of drilling waste was flowing into the Kesha River, a tributary of the Mzymta, near a portal to Tunnel No.3 on the road and rail line from Adler to Krasnaya Polyana, said Andrei Rudomakha of Environmental Watch on North Caucasus in a statement on August 21, two days after the spill. The road and rail line is one of the biggest and most expensive infrastructure projects of the Sochi Olympic Games. “Apparently an accident this week in the tunnel resulted in a release of a large amount of waste and water, which has overfilled the provided container,” he wrote. “There were no state inspectors at the scene of this crime, and one can only predict that oversight agencies will sweep it under the rug because it clearly collides with the myth of “the greenest Olympic games,” he said. Tests showed that the source of pollution came from the Kepsha village area. The water contained three times the permitted levels of nitrogen nitrite and oil products, four times the allowed level of phosphates, and 13 times the permitted level of synthetic surfactants. Rosgidromet does not name the culprit behind the pollution, nor does the agency explain how such a large amount of pollution ended up in the river. Preparations for the 2014 Winter Games in Sochi have seen what Rudomakha calls “an infinite number of environmental crimes, many of which were caused by Russia’s railroad monopoly Russian Railways,” which is developing the Adler-Krasnaya Polyana road and rail line. Russian Railways has made no comment on the toxic spill.